For this month's taste & create, I have been paired with bad girl's kitchen. Not the host Min, but another "bad" girl : Shell. And thanks to this fabulous event, I have just discovered my best pizza dough ever. I don't know if it's the honey Shell adds or the extra olive oil but this was a really soft, slightly thick pizza. I made half of Shell's recipe, which is just enough for two pizzas. So I halved the dough, then rolled it into a circle. This I then divided into four quarters and spread a different topping on each. 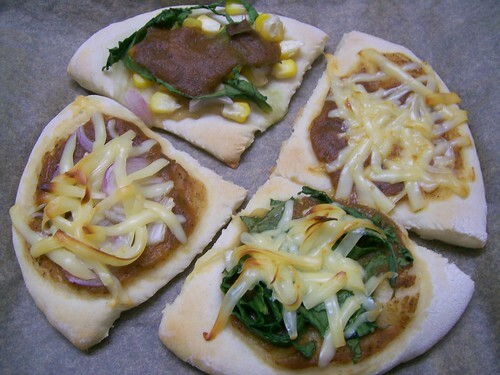 The one on top is mixed veggies (sliced onions, spinach, corn) topped with my pizza sauce. Going clockwise, you next have plain tomato and cheese. Then comes spinach (pizza sauce, then a layer of chopped spinach topped with a layer of cheese). The last one's the same except we use onions instead of spinach. A hearty weekend dinner, and enough dough in the freezer for a rainy day. 4-in-1 pizza also goes to Zorra who is celebrating the second anniversary of Bread Baking Day with a pizza party. nice one! !nothing like homemade pizza isn't it? Wow.Love it Simran.Love all the toppings. Love pizza. Love home made pizza even more. :) Will have to try it soon. Re: your earlier post about Juhu beach, you made me crave the brownies and irish coffee at Prithvi Theatres. Oh wow..that's quite a pizza party with all the different toppings. Looks awesome, what a wonderful healthy creation at home, great!! Glad you like the pizza dough recipe! It's a huge favorite of mine! I make several batches and freeze it for later. LOVED the Paneer Cheese Sandwich! Interesting cheese! Never had it before!